UNMC › Eppley Institute › About Us › Faculty › Angie Rizzino, Ph.D.
Increasing SOX2 Levels in SOX2-Expressing Tumor Cells Reduces Their Proliferation: Over the past ten years, there have been many studies reporting that increasing the expression of SOX2 in a wide range of SOX2-positive tumor cells [e.g. glioblastoma, prostate cancer, and pancreatic ductal adenocarcinoma (PDAC)] enhances their proliferation both in vitro and in vivo.5 Our recent studies argue strongly that these findings need to be reevaluated. In each of the earlier studies, tumor cells were engineered to stably overexpress SOX2. 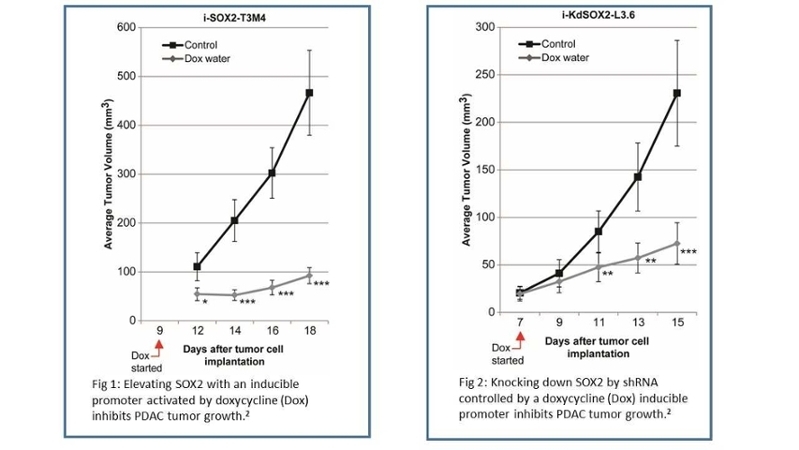 Remarkably, we have observed completely different results when tumor cells are first engineered to express SOX2 from a doxycycline inducible promoter and later doxycycline is added to the culture medium to elevate SOX2. Importantly, our studies demonstrate that elevating SOX2 with the aid of an inducible promoter in medulloblastoma and glioblastoma, as well as in breast tumor cells, reduces proliferation of each tumor cell type.1 More recently, we demonstrated that this is also true for PDAC tumor cells2 and for PCa tumor cells (unpublished data). For our PDAC and PCa studies, we engineered three different PDAC tumor cell lines and five PCa cell lines for inducible overexpression of SOX2. For each PDAC cell line, increasing SOX2 (~3- to 10-fold) from a doxycycline inducible promoter leads to a reduction in proliferation (in monolayer and in suspension) and the degree of growth inhibition increases as the level of SOX2 is increased. Moreover, we determined that the tumorigenicity of PDAC and PCa cells is blocked once SOX2 expression is elevated in vivo (Fig 1).2, unpublished results Importantly, knocking down SOX2 also reduces the tumorigenicity of PDAC cells (Fig 2).2 Others have shown that this is also true in PCa cells. The contrasting results obtained when SOX2 is stably overexpressed versus our inducible overexpression studies are due to a fundamental difference in experimental design. Our tumor cell lines engineered for inducible overexpression of SOX2 are generated via drug selection of lentiviral-transduced cells, which occurred at frequencies greater than 70%. In our studies, SOX2 levels are only elevated after the transduced cells have been established and the non-transduced cells have been eliminated by drug selection (puromycin). In direct contrast, cell lines engineered to stably overexpress SOX2 are subjected to drug selection when SOX2 levels are ectopically elevated from the beginning. As a result, any cells that are unable to proliferate or grow more slowly due to elevated levels of SOX2 will be lost during the drug selection period as the faster proliferating cells expand. Consequently, the cells present in these drug-selected populations represent only a subpopulation of the parental cells. Our studies indicate that this is an exceedingly small subpopulation. 1) Cox JL, Wilder PJ, Desler M, Rizzino, A. Elevating Sox2 levels deleteriously affects the growth of medulloblastoma and glioblastoma cells. PLOS One, 7:e44087, 2012. 2) Wuebben EL, Wilder PJ, Cox JL, Grunkemeyer JA, Caffrey T, Hollingsworth MA, Rizzino A. SOX2 functions as a molecular rheostat to control the growth, tumorigenicity and drug responses of pancreatic ductal adenocarcinoma cells. Oncotarget, 7:34890-34905, 2016. 3) Kopp J L, Ormsbee BD, Desler M, Rizzino A. Small Increases in the Level of Sox2 Trigger the Differentiation of Mouse Embryonic Stem Cells. Stem Cells, 26:903-11, 2008. Accepted 23 January 2008. 4) Boer B, Kopp J, Mallanna S, Desler M, Chakravarthy H, Wilder PJ, Bernadt C and Rizzino A. Elevating the Levels of Sox2 in Embryonal Carcinoma Cells and Embryonic Stem Cells Inhibits the Expression of Sox2:Oct-3/4 Target Genes. Nucleic Acids Research, 35:1773-1786, 2007. 5) Wuebben EL, and Rizzino A. The dark side of SOX2: Cancer – a comprehensive overview. Oncotarget 8:44917-44943, 2017. 6) Rizzino A. Concise review: The Sox2-Oct4 connection: critical players in a much larger interdependent network integrated at multiple levels. Stem Cells 31:1033-1039, 2013. 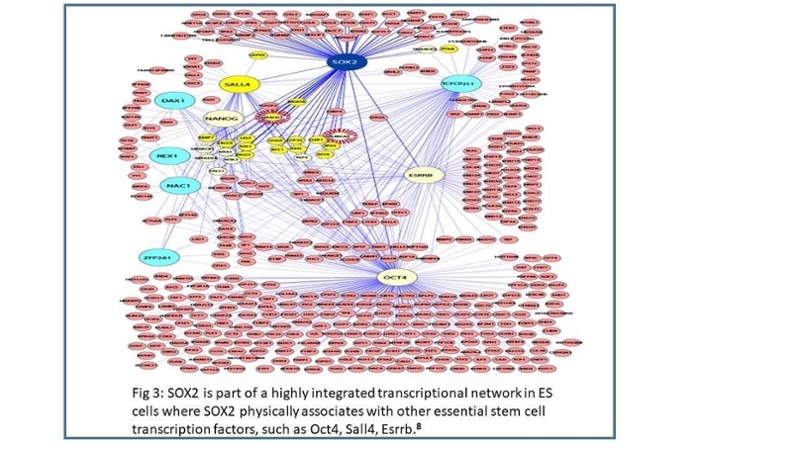 7) Mallanna SK, Ormsbee B, Iacovino M, Gilmore JM, Cox JL, Kyba M, Washburn MP, Rizzino A. Proteomic analysis of Sox2-associated Proteins During the Early Stages of Embryonic Stem Cell Differentiation Identifies Sox21 as a Novel Regulatory of Stem Cell Fate. Stem Cells, 28:1715-27, 2010. 8) Gao Z, Cox JL, Gilmore JM, Ormsbee BD, Mallanna SK, Washburn MP, Rizzino A. Determination of protein interactome of transcription factor Sox2 in embryonic stem cells engineered for inducible expression of four reprogramming factors. J. Biol. Chem., 287:11384-97, 2012. 9) Cox JL, Wilder PJ, Gilmore JM, Wuebben EL, Washburn MP, Rizzino A. The SOX2-interactome in brain cancer cells identifies the requirement of MSI2 and USP9X in brain tumor cells. PLoS One, 8(5):e62857, 2013. 10) Cox JL, Wilder PJ, Wuebben EL, Ouellette MM, Hollingsworth MA, Rizzino A. Context-dependent function of the deubiquitinating enzyme USP9X in pancreatic ductal adenocarcinoma. Cancer Biology and Therapy, 15:1042-52, 2014.